Previously a Holiday Inn at Manchester airport, if you're after a hotel that is going to tick all the boxes, look no further: The re-branded Airport Inn in Wilmslow, Manchester is not only great value-for-money but also offers contemporary rooms that are well-equipped for the entire family, a Terrace Restaurant with a menu to suit all and, to top it off, a swimming pool to help you relax and unwind ready for your holiday. 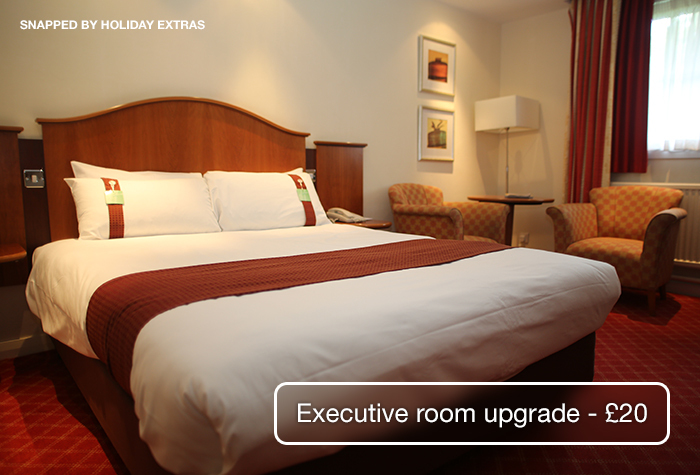 Be sure to compare Manchester airport hotels with Holiday Extras in advance to make sure you receive the best price possible. Really good and friendly staff.nothing is a problem for them to help with your needs and service.lovely smart and clean hotel in perfect surroundings close to the airport. Airport Inn only a few minutes from airport. Good sleep and meal. Meet and greet T2 worked smoothly outgoing and return. Our customers rated Airport Inn on average 8/10 (1302 reviews). 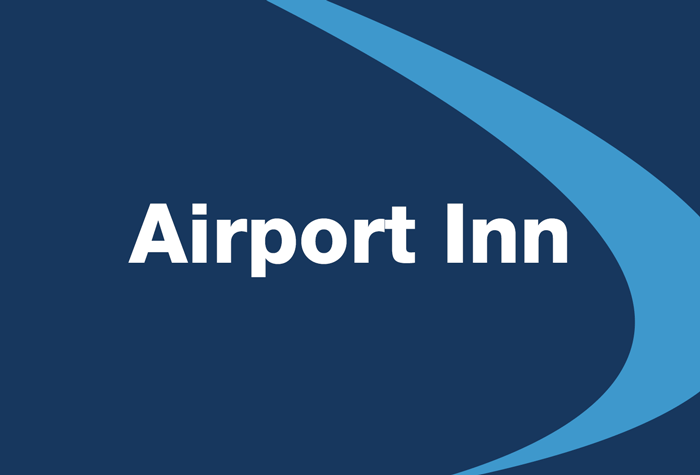 Read Airport Inn reviews. 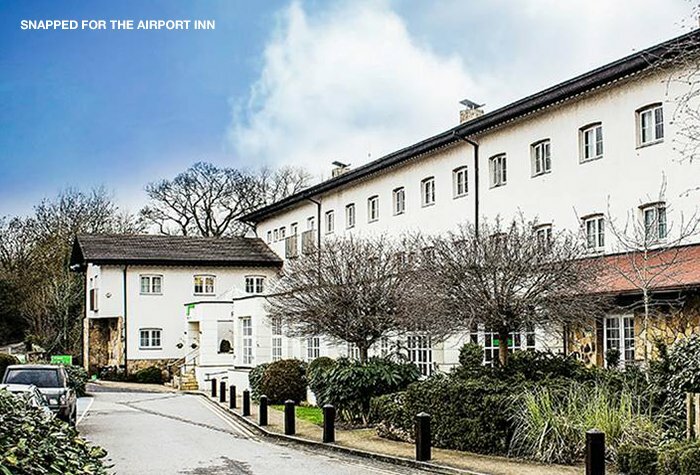 With its own restaurant, 2 bars and a gym and spa, youll be starting your holiday early at the Airport Inn. 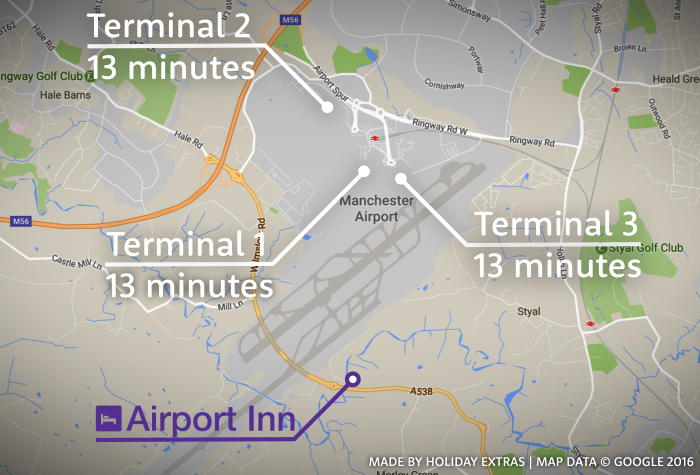 The Airport Inn is a 15-minute taxi ride away from the terminal. Drive to the terminal and follow the signs to the hotel. Full details will be on your confirmation email. Check-in is from 14:00 and you need to check-out by 11:00. 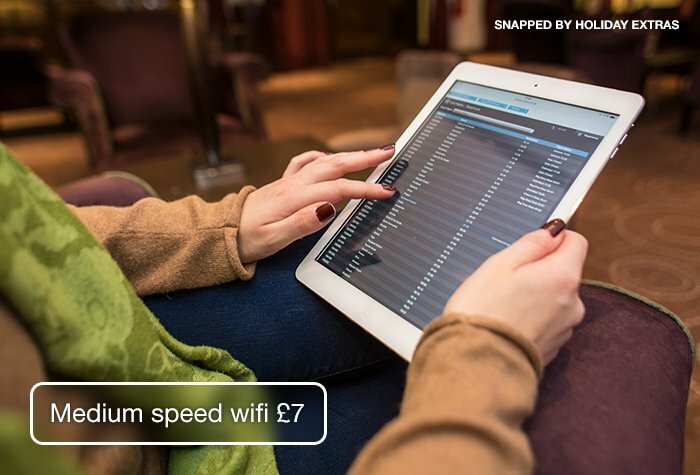 If youre travelling by train, call the hotel when you arrive at the station and theyll give you a short code. Youll then need to call the taxi company, quote them the code and theyll come and pick you up and take you to the hotel at a cost of £5. Bedrooms at the Airport Inn are delightfully decorated, bright and spacious. All rooms have their own bathroom, a TV with pay-per-view movies and free wifi. The hotel has a gym and a spa - perfect for getting into shape or relaxing before your flight. Its open from 06:30 to 22:00 during the week and 07:30 to 21:00 at weekends. 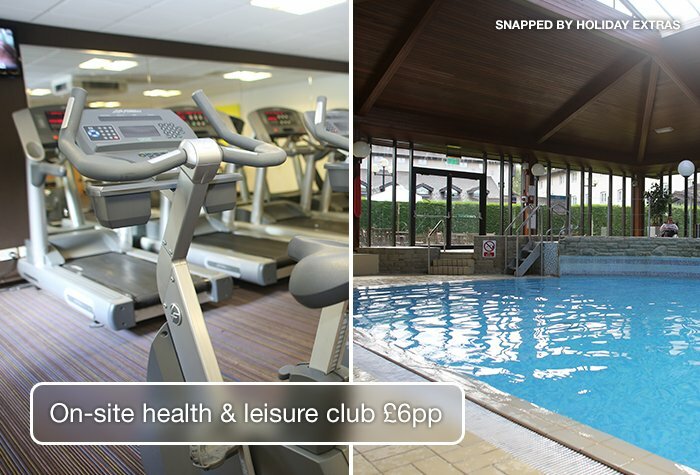 Access to the gym is free for guests and you can also book in spa treatments for an extra cost. 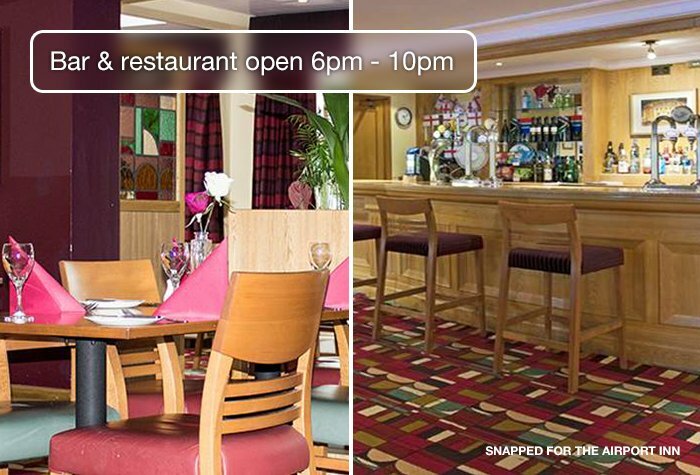 The Airport Inn has one restaurant, the Terrace restaurant, and it serves a variety of dishes to suit all tastes from 18:00. 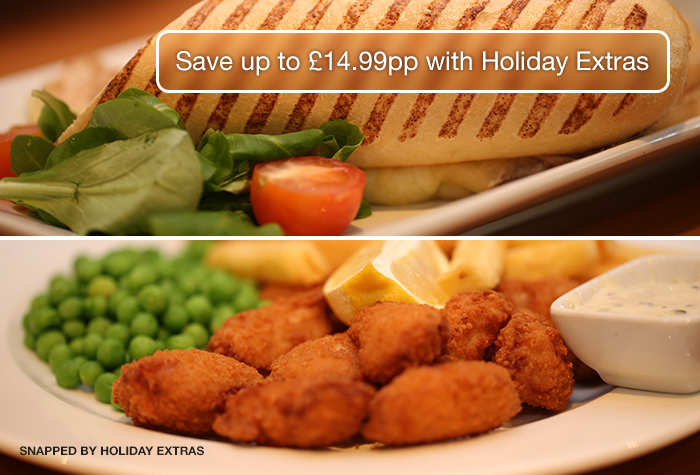 You can add dinner to your booking on the next page. For smaller meals, head to one of the bars. The Airport Inn has 2 bars. Both serve beers, wine, spirits and soft drinks. The Terrace bar has indoor and outdoor seats, making it popular all year round, and serves light lunches and snacks. The Motivation lounge bar opens out onto the hotels private gardens, making it particularly popular in the summer. 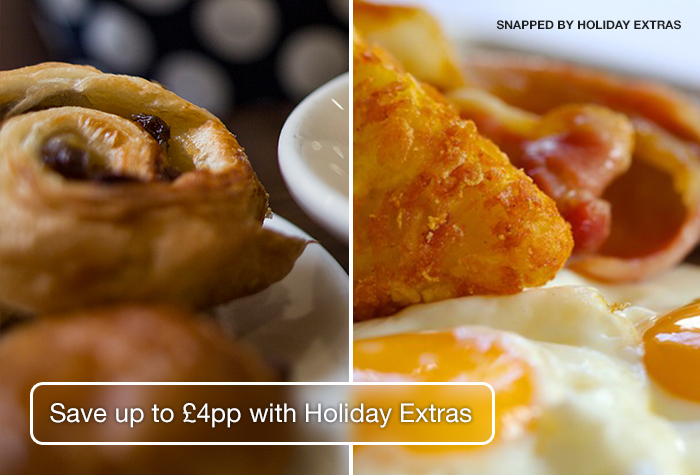 A continental breakfast is served from 04.30 every morning and costs £6.95. Theres also a hot buffet breakfast that starts a bit later, from 07.00 to 09.30 every morning and costs £7.50. 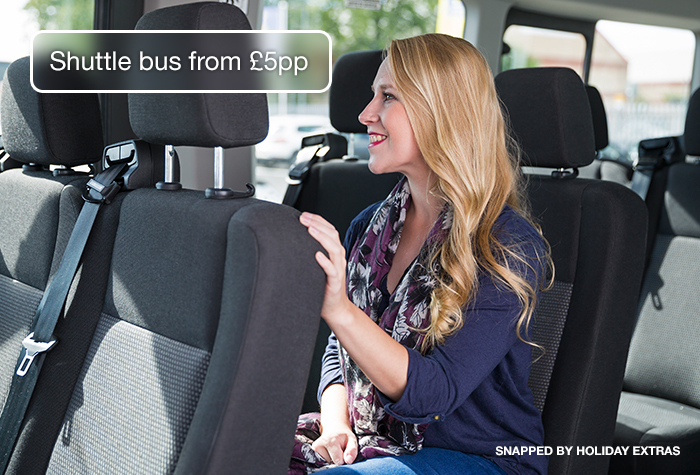 Its a 15-minute taxi journey to the terminal and costs £6 return. See our transfer tab for more information. If you need assistance getting through the hotel or to the taxi, the hotel can arrange this for you. 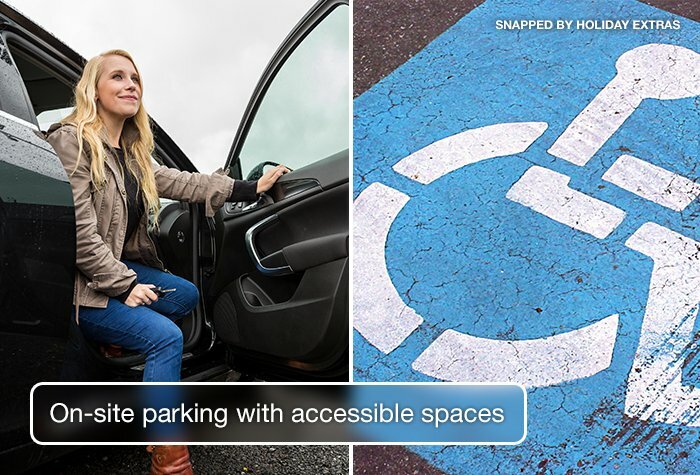 Accessibility - The hotel has 2 accessible rooms available to disabled guests and 5 disabled parking bays. 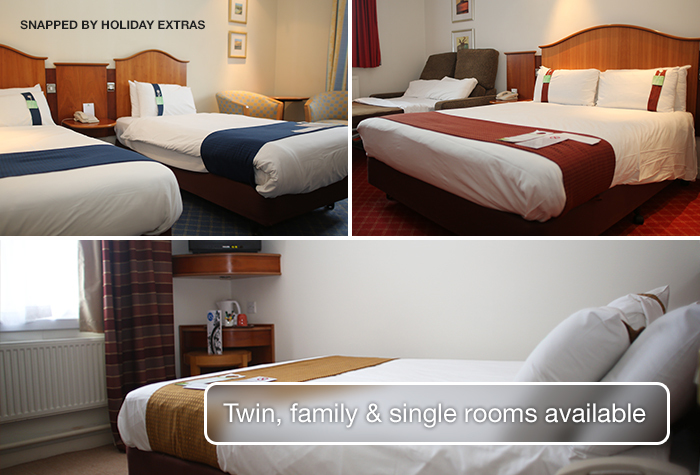 If you would like to book one of these rooms please call us on 0800 093 5478. It costs £5 to use the pool, but under 16s are free when accompanied by an adult. If you need a cot in your room, let us know in advance so we can arrange one for you. When you get in at reception, you'll need to make sure you put your car's registration number into the hotel's computer system, otherwise you'll end up with a parking fine. Disabled facilities The hotel has two rooms that are accessible to disabled guests. Drive to the hotels car park and park overnight - your confirmation email will include driving directions and a postcode for satnavs. Check in is from 14:00 - park your car and head inside to check in. You'll need to make sure you put your car's registration number into the hotel's system at reception, otherwise you'll end up with a parking fine. Head to the Long Stay T1 & T3 car park (directions will be on your confirmation). Drive up to the barrier, which will recognise your number plate and rise automatically - you can keep your car keys. Take the shuttle to the terminal. It takes 5-10 minutes and runs every 10 minutes, 24 hours a day. Collect your luggage and catch the transfer bus back to the car park. Collect your car, drive to the barrier and it will lift automatically. Drive to the hotel - your confirmation email will include driving directions and a postcode for satnavs. Book your taxi to the airport with reception for the next morning. You'll need to choose a time slot - the hotel staff will give you a ticket with return details on it. The hotel runs a shuttle to the terminals. It takes 13 minutes and costs £6 return. Alternatively, a taxi to the airport will cost around £10 each way when booked through the hotel. Taxis run 24-hours. Collect your luggage and call the number on the back of the ticket, meet the taxi or minibus and go back to the hotel to pick up your car. Drive to the hotels car park and park overnight - your confirmation email will include driving directions and a postcode for sat navs. Head to the Long Stay T2 car park (directions will be on your confirmation). Park in any space and you can keep your car keys. Take the shuttle to the terminal. It takes 5-10 minutes and is included in the price. It runs every 15 minutes, 24 hours a day.